Each time I pass St Pancras station I notice a bit more progress in the work and a little less scaffolding. Nice view for these 2 workmen don't you think. What kind of station is this? The details are amazing on this, just fabulously gorgeous! There is no way you'd get me up on that scaffold no matter what the view though! Great shot and beautiful architecture. Nice view and a little scary too. I can't wait to see this station since the Eurostar now leaves from there. I hear the champagne bar is quite nice. The first time I saw this station I was gob-smacked. I'd been to London several times before I ever saw it. It was closed and being transformed for Eurostar at that time. I wish I could have inveigled my way inside at that time. I'm not a gambler but if I were I'd bet on a pic of the British Library tomorrow. Beautiful building and photograph of it. So much detail, incredible. Loved yesterday's art too. It is a stunning station and has been really well restored but I don't think I'd fancy sitting on a plank all the way up there! Wow this is a station?? It's so beautifull! If ever I'd pass there everyday to school, i'd be very inspired and leave all my worries as I set my eyes on there! Love it! Thanks for droppin by my blog! I hope my exams do come well! Thanks and Mabuhay! It is a very ornate station and it's good to see a building of the stature restored rahter tan demolished. 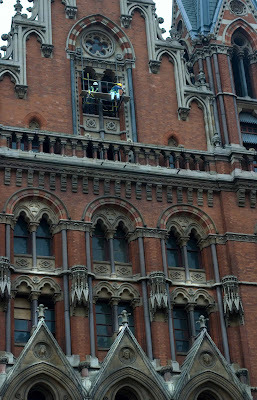 I don't think I'd like their job up there though. I'm glad to see they are wearing their safety harnesses! It looks like a nice venue for the Eurostar. This is simply beautiful and how nice that it's being taken care of rather than knocked down! I walked past (and out of) this station every day for three months in 2003. Most of what I noticed was all the road construction! I love this building...so beautiful. I think St. Pancras station is one of the most beautiful buildings in London. Hard to believe they were almost going to tear it down!